Railpictures.ca - Doug Page Photo: Here’s one of those great 1960s lash-ups–CN RS18 3664, F3B 9001, C424 3233, GP40s 4010 and 4013 parked near the diesel shop in Hamilton. They will soon lead an eastbound freight out of town. At the time, the F3B was based in Fort Erie and the GP40s in Toronto. The 4013 was almost new, having been delivered a few months earlier, and the 3233 had been delivered in the first half of 1967. | Railpictures.ca – Canadian Railway Photography – photographie ferroviaire Canadienne. Caption: Here's one of those great 1960s lash-ups--CN RS18 3664, F3B 9001, C424 3233, GP40s 4010 and 4013 parked near the diesel shop in Hamilton. They will soon lead an eastbound freight out of town. 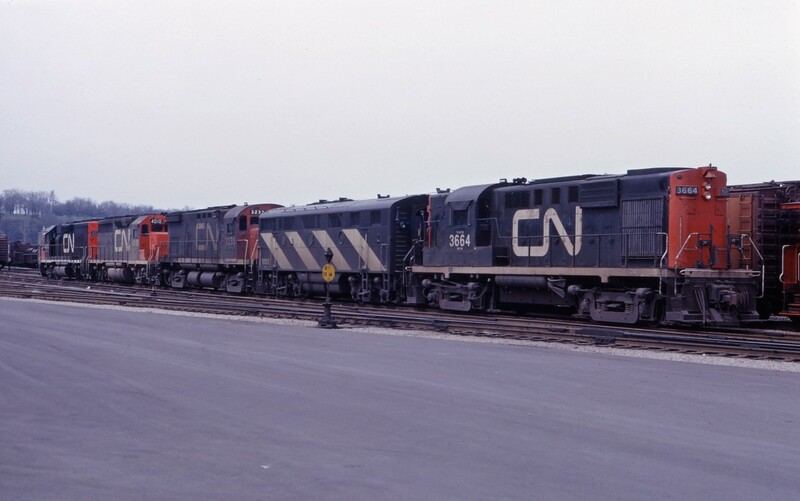 At the time, the F3B was based in Fort Erie and the GP40s in Toronto. The 4013 was almost new, having been delivered a few months earlier, and the 3233 had been delivered in the first half of 1967.